Hi everyone, we’re so excited to be partnering this summer with Operation Write Home for today's Stampede/blog hop extraordinaire! OWH is a nonprofit that sends beautiful handmade cards to our service members so that they can write home to their families. Isn’t that just the best? There’s no Hallmark store in the desert, so this is a pretty important gift we can give them as crafters! Our In My Heart set was inspired by the mission of OWH; we know that many of those serving overseas have little kiddos at home that they write to. 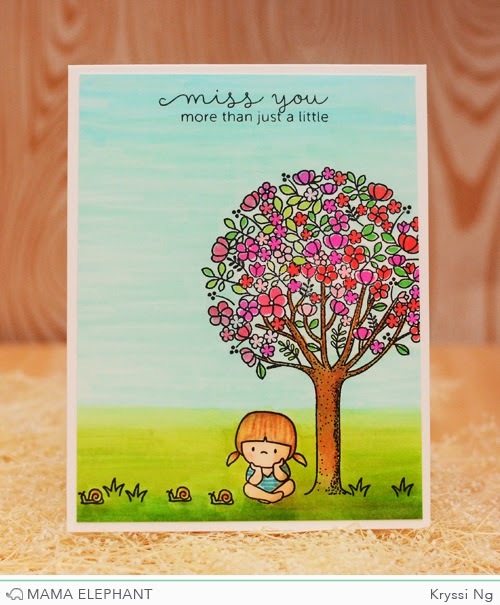 So we designed cute little kids and sentiments to express just how much those little folks are missed! The drawings are done in such a way that they can be adapted to different ethnicities too, making this a really flexible set. We’ll be donating 20% of the proceeds of In My Heart stamp sets sold on our retail site from now until July 31st - we really want to help them fundraise for all their efforts! We also know you’ll want to join in on the mission to serve the troops - be sure you visit the OWH website and read all the guidelines carefully….you’ll learn about why glitter is dangerous to send, so leave the stickles behind when making cards for heroes! Lots more information is available on their Welcome page - tons of questions are answered there! And they have a fun YouTube show each weekday with project info, tutorials, and more - check it out HERE. Here's my card for the hop.. simple and straightforward, so easy to color them! I used In My Heart and Tree Friends. All colored with Copic markers! Ready to hop and see all the amazing things you can do with this cute little set? Thank you for hosting this blog hop and the fundraiser - can't wait to see all of the ideas using this stamp set! I love this set, and what an adorable card you made. Thank you so much for supporting OWH. Your card is so super sweet and your little girl is just so precious. Super awesome coloring skills you are one super talented gal. What a fun hop! How cute! Sweet little kiddos! Very cute and great coloring. Sweet scene - the background is amazing. Love this set and the cause!! Thank you! OWH stamp set is really cute! This card is inspiring. Oh my gosh what a sweet card. These little kids are so perfect. Thank you so much for partnering with Operation Write Home by making this beautiful "In My Heart"" stamp set!! It is wonderful!! I got mine the other day and I have already used a couple of the sentiments on cards for OWH!! Very cute card...love this outdoor scene. Love this adorable card, the snails are so sweet and the coloring is fabulous. So sweet! Love how you paired the little girl with that fab tree! Such a great idea. Thank you so much for supporting OWS. Your card is really cute. Adorable! So awesome that you are supporting OWH! Such a darling card, Kryssi! Pairing these 2 sets was such a great idea, and your coloring is just beautiful! So happy you've teamed up with OWH for this cause...thanks! Awww. How sweet it is! Thank you for sharing this with us hoppers! What a cute stamp set! Especially nice since you are supporting OWH - thank you! Will definitely be putting this set on my "to buy" list. Two of my favorite designers, both taking part in such a wonderful fundraiser! I'm so excited, because my set of stamps/dies are already on their way and I was only too happy to help OWH. Now, when I make my next batch of OWH cards, I'll have these and your fabulous inspiration to use for the kiddo cards! You're ALL so great to be part of this! Big Hugs!! I love this set...just got it in the mail!! Can't wait to play with it!! Love this card, and the stamp set! That coloring is great, and I love the scene you built around the little girl. My card-making budget is shot for this month, but I will be sure to order this set next month, before the fundraiser ends. Thanks so much for supporting OWH! Love this card. I participate in OWH and it is wonderful. Sandy is great! Beautifully done! Love the gradients you were able to achieve in the blues and greens! And the little girl is adorable. This is awesome! I was inspired also by this stamp set to begin creating cards for OWH. I ordered my OWH official stamp for the back of the cards just a few days ago and it arrived just today. I think you guys are awesome for partnering with them and calling attention to this awesome cause. Your card is GORGEOUS, Kryssi! So sweet! I love this set! This is such a great organization to be partnered with! I love the idea! Had so much fun on the blog hop, saw so many beautiful creations and cannot wait to get that stamp set ASAP! Awesome program and love the stamps. Great scene creation for this inspirational stamp. Just love the collaboration. Thank you so much for supporting OWH and donating the 20 percent. Beautiful card - love the bright colorway. Thanks for supporting OWH! What an absolutely precious card! That tree is amazing and your background is flawless! You may call it simple and straight forward but I call this gorgeous , thank you for supporting OWH. My stamps arrived today and I hope to play with them soon.